Historic century old traditional carousel, originally installed in the 1910s. 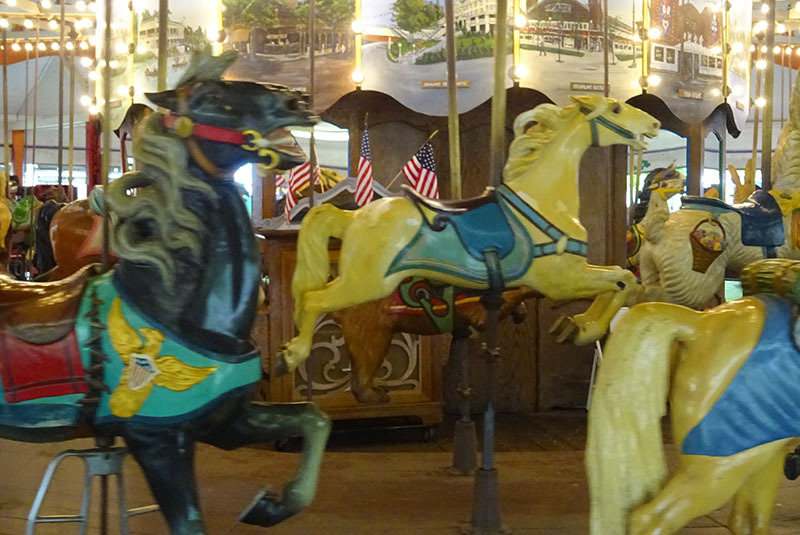 Conneaut Lake Park's carousel sits under the protection of its Pavilion, giving children and grown ups of all ages rides on its traditional wooden figures. It is hard to find the exact date the carousel was installed in the park. A sign next to the ride itself suggests it arrived in approximately 1914, with other sources say 1913 or even 1905. Whichever of these dates is true, the carousel is now over a century old. The ride's frame is original as built by TM Harton of Pittsburgh. Riders can choose between 36 horses, 12 other animals and 2 chariots. Five of the wooden figures are original and were carved by Daniel Carl Muller. In 1989, 19 original horses were auctioned to raise money to pay for restoration work on the carousel, and were replaced with reproductions created by The Carousel Works, Inc. of Mansfield, Ohio. The Carousel's music is provided by an Artisan XA band organ nicknamed "Artie", which was originally built in 1924 and has recently been restored.